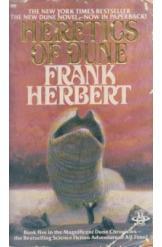 Heretics of Dune by Frank Herbert, book 5 of the Magificent Dune Chronicles, bestselling sci fi adventure of all time. Book in a good condition. All pages intact.